Soochippara waterfall also called Sentinel rock falls is 13 kilometres from Meppadi and 22 kilometres south of Kalpetta. The drive from Meppadi is a lovely uplifting experience as the vehicle curve through mountain paths amidst tea estates and luxuriant vegetation. Sun rays peep into mist clad valleys and scatter over leafy greens. Wayanad puts together a statement of magnificence powerful enough to conquer all hearts. The journey hits a temporary halt at a flat hill top where a few shops and a tourism office suddenly come into view. After parking vehicles there, tickets to access the waterfall have to be purchased from the tourism office. The charges are nominal. Further journey forward is a downward trek of nearly one kilometer. The ticket check point, en route, also keeps vigil on any sort of plastic getting in. Soochippara is a very environmentally friendly place where they strictly adhere to plastic free policies. Plastic items can be taken in upon payment of a deposit. Refund is conditional on return of the plastic item. Witnessing the plastic and litter free landscape we wish if the whole of Kerala could be clean like this! Authorities and staff at Soochippara waterfall definitely deserve thumbs up. The path has been beautified with a paved walkway and wooden benches alongside. Development appears to be harmonious to the surroundings. On the way, there are some thatched resting spots resembling tree houses. Altitude of this area makes it a vantage point to enjoy the spectacle of distant valleys and green peaks. 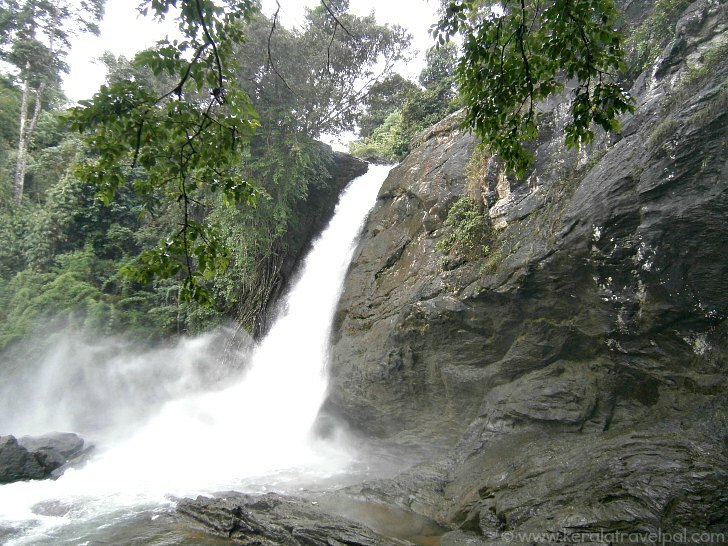 Soochippara waterfall is a popular destination on weekends. The peak season here is Onam vacations as well as the school holiday season of April and May. This busy family vacation spot receives thousands of visitors on peak days. Charm of the place, tourism department’s efforts to upgrade, ease of access, friendly and helpful staff – several factors are in play to achieve such an outcome. At Soochippara, water falls from a height of 20 metres and forms a pool before gushing away as a small stream. The nearby rock is 200 metres high and resembles a needle so it got the name needle rock. 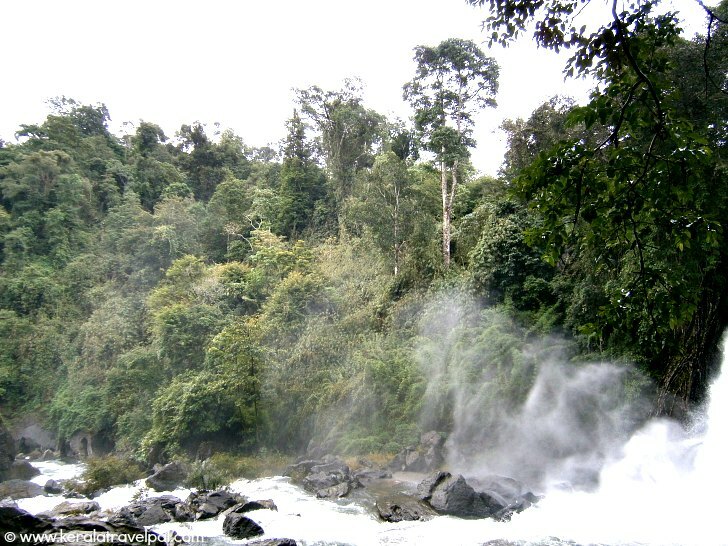 Not just the waterfall, the whole area is known by the name Soochippara. The bottom pool is good for a leap in. However, access to the pool is allowed only during December till end May. Rains in surrounding hills can cause water to rush in unexpectedly as torrents drowning or washing people away. Also, rocks can fall in along with water. Dry season from December till May is considered safe. Nearby rocky region used to be a trekking spot till a couple of years ago. However, due to landslides trekking not allowed nowadays. From Meppadi, a short drive of about 20 minutes takes you here. If you are relying on bus service, add a further 2 kilometres to your walk, one way, in addition to the 1 km trek downhill. Hiring a car or tuk-tuk from Mepppadi is another option. Nearest towns : Meppadi at 13 kms and Kalpetta at 22 kms. Bus Station : Meppadi Bus Station at 13 Kms. Taxi/ Auto-rikshaw Hire : Meppadi Town at 13 Kms. Railway Station : No rail access to Wayanad District. Nearest Railway Station is Kozhikode at 97 Kms. Air port : Kozhikode Int’l Airport (CCJ) at 117 Kms. Food Options : One restaurant near car park (1 km from falls). Some restaurants at Meppadi. Accommodation Options : A few home stays along Meppadi to Soochippara route. A few lodges and hotels at Meppadi town. More choice at Kalpetta, the largest town in Wayanad. Best time to visit : Can be visited throughout the year. Beware of slippery conditions during peak monsoons. Pool of the waterfall can be accessed only during Dec – May. Nearby Attractions : Chembra peak, Edakkal Caves, Meenmutty waterfall, Kanthanpara waterfall, Kalpetta town (shopping & food), Muthanga Sanctuary, Kuruva Islands, Banasura Sagar Dam and Thirunelli.